Employment Equity Season – Are you ready? As Employment Equity is well and truly underway, some companies might find themselves scrambling for all of the information that they need for their reports. Documents like the EEA2 contain a vast amount of information which should be updated through the year, on your payroll system. Pay Solutions payroll offers you an HR Management platform which links to your Payroll system which allows you to immediately download completed reports for the Department of labour based on what has been captured in the system and based on the movements of your workforce distribution, which covers recruitment, promotions, terminations and skills development and is offered at the fraction of the cost of other Employment Equity modules provided by some service providers. In addition, you can save on the cost of paying for expensive software upgrades, consultation fees and time wasted waiting for reports to be fixed by your external consultant. Employment Equity reports should be readily available for use by your company as a standard part of your payroll and HR service packages. Collating time and potential capturing errors can be avoided through the simple and effortless technology of the cloud-based payroll system offered to all our clients, by Pay Solutions. Employment Equity can make or break your organisation. Is your company prepared to face severe or possibly crippling fines if you not staying up to date with the ever-changing face of equity? Avoid fines and last minute panic and stress which arises when submissions are done too close to the deadline date and remember that the Department of Labour reporting system has been upgraded from last year. So expect that something might not always work out 100% first time. 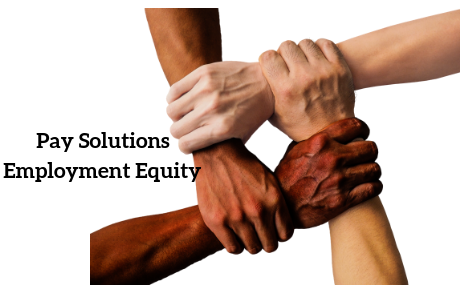 Pay Solutions offers qualified consultants to assist you with your Employment Equity. We will assess the current status of your employment equity within the company, whether you are newly designated or already reporting regularly, legislation and requirements change. It is our role to keep you up-to-date and compliant. We will guide your company through the process ensuring equity in your organisation meets the requirements of the Employment Equity Act. In order to achieve full compliance for employment equity, company’s must meet several specific requirements, all of which are equally important. Failing to achieve all of the aspects of Employment Equity can result in non-compliance and subsequent financial strain as a result of heavy fines.